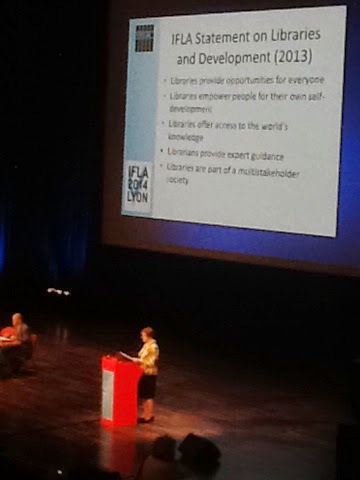 Today the Lyon Declaration launch, at the IFLA conference in Lyon, it's about on Access to Information and Development. The Lyon Declaration calls upon United Nations Member States to make an international commitment through the post-2015 development agenda for the Sustainability Development Goals to ensure that everyone has access to, and is able to understand, use and share the information that is necessary to promote sustainable development and democratic societies. It was prepared by IFLA and a number of strategic partners in the library and development communities. I think it is important that libraries marks that they play an important role in a sustainability development, but also a more democratic world. For me, Lyon Declaration is natural follow on IFLA trend report, which was published last year. The report I have written a lot about since see. Today we also shall discuss the IFLA Trend Report, and how we further develop themes that contribute to a strong information society and in which libraries play a role, such as: the high value of literacy and information literacy skills; incorporating local content into creativity, entrepreneurship and publishing; and citizen and multi-stakeholder participation in civic engagement and the transformation of societies.